Upon arrival at Delhi airport ex flight (to be advised) you will be met and transferred to your hotel. At 0800 hrs you will be picked up from your hotel and driven from Delhi to Agra enroute visiting Sikandra and check in at your hotel. At 1400 hrs you will be taken for afternoon city tour of Agra visiting Taj Mahal with it’s lacy white grandeur, it is perhaps the most perfect architectural monument in the world. Built by Shah Jahan, the Taj Mahal remains today, as a symbol of his eternal love for his wife, Mumtaz, and also visit Agra fort and local market. Overnight : Hotel in Agra. At 0730 hrs you will be picked up from your hotel and driven from Agra to Ranthambhore enroute visiting Fatehpur Sikri and check in at your hotel. Today early morning you will be taken for Jeep safari inside Ranthambhore National Park for wildlife viewing. Return back to hotel for Breakfast. Today late in the afternoon your will be taken for Jeep Safari inside Ranthambhore National Park for wildlife viewing. At 0800 hrs you will be picked up from your hotel and driven from Ranthambhore to Jaipur and Check in at Hotel. 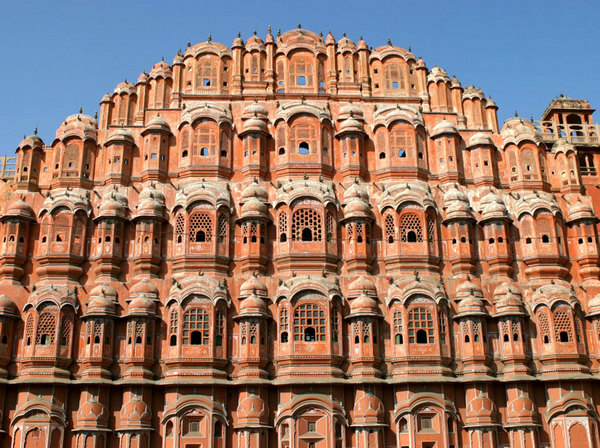 At 1400 hrs enjoy city tour of Jaipur including the City Palace Museum, an imposing blend of traditional Rajasthani and Mughal art. Continue on to visit the Jantar Mantar, an amazingly advanced observatory built in 1726 A.D. You will also visit Hawa Mahal, the Palace of Winds, a five storied wonder with a spectacular pyramidal facade and overhanging windows with latticed screens, domes and spires. At 0730 hrs you will be picked up from your hotel and driven from Jaipur to Delhi (drop off at place to be advised).